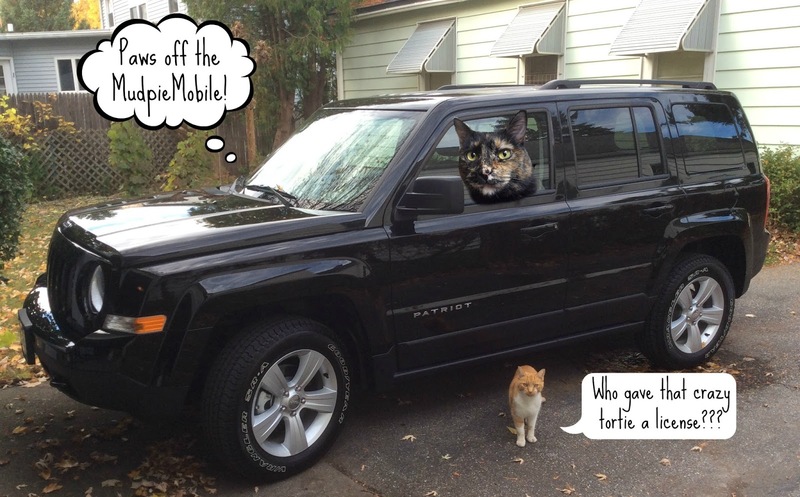 Melissa's Mochas, Mysteries and Meows: Our New Wheels! I want to know... who's the orange and white kitty? Maybe he wants to ride! Who's your new friend Mudpie? You sure look good behind the wheel there, Mudpie. Congratulations to your mom on the new wheels! How odd...a cat who likes a car??? I'm really confused. Super nice ride, Mudpie. Where're we going first? Nice ride, Mudpie! I'd say you're going cruisin' for mancats, but it looks like you might have already found one there. Purrs, and happy cruisin'! Swanky ;). Hope you enjoy it! Hey Mudpie, haz you gots your learnter purrmittens yet? Love a good cat mobile! Looks like you gots lots of room to haz a pawty in there! -Purrz from Peach, the rescue Kitty. You could works fur UberKitty and give rides to tasty chicken stands. Nice ride, I love your new Mudpie Mobile! Drive safely. Uh oh, drive safely, tortie girl! Don't drive angry! Nice car but I'll keep my 'stang. This is hilarious! Love the captions. Sweet ride, Mudpie! Vroom vroom!